The next Intermediate Examination / Accounting Technician Examination (ATE) under the syllabus as specified by the Council in accordance with Regulation 28G (4) of the Chartered Accountants Regulations, 1988 as amended vide the Chartered Accountants (Amendment) Regulations, 2017 (as published in the Gazette of India: Extraordinary, dated 25th May, 2017 and Notification No. 1-CA(7)/78/2016 published in the Gazette of India, Extraordinary dated 25th May, 2017) will be held in May, 2018. The students of Professional Competence Course or the erstwhile Professional Education - (Course II) and erstwhile Intermediate Course covered under previous syllabus as per para 2 or 2A of schedule B to CA Regulations, 1988 and Intermediate(IPC) now wishing to appear, if otherwise eligible and converted into Intermediate Course, have to fill up this form. Note: (i) Examination timings at Abu Dhabi and Dubai Centres will be 12.30 P.M. to 03.30 P.M. UAE local time equivalent to 2.00 P.M. to 5.00 P.M. (IST). Examination timings at Kathmandu centre will be 02.15 P.M. to 05.15 P.M. Nepal local time equivalent to 02.00 P.M. to 05.00 P.M. (IST). Examination timings at Muscat centre will be 12.30 P.M. to 3.30 P.M. Oman local time equivalent to 02.00 P.M. to 05.00 P.M. (IST). (ii) There will be no change in the examination schedule in the event of any day of examination schedule being declared a Public Holiday by the Central Government or any State Government. 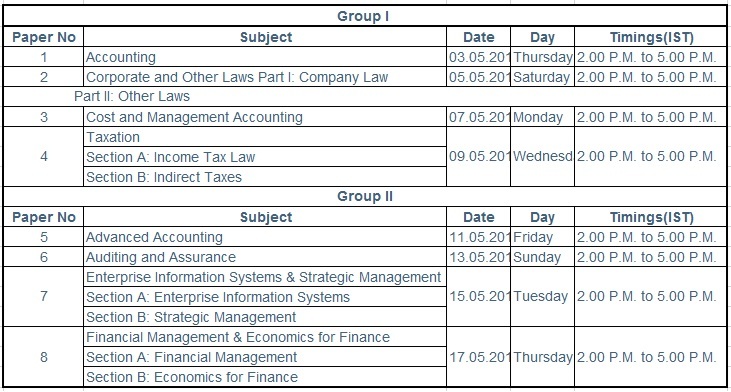 Paper 4- Taxation of Intermediate and Paper-7 Enterprise Information Systems & Strategic Management of Intermediate have been bifurcated into two sections. Similarly the question paper in respect of Paper 7 will have two sections. The said papers will continue to be held in a single session of 3 hours. Candidates will be required to write their answers in respect of each of the sections in two separate answer books. They will be required to write answers relating to Income Tax Law in the answer book meant for Section A ( duly marked "A" ) and those relating to Indirect Taxes Law in the answer book meant for Section B( duly marked "B"). For the convenience of candidates, the cities of Ahmedabad, Aurangabad, Bengaluru, Bhopal, Chennai, Delhi/New Delhi, Hyderabad, Indore, Kolkata , Mumbai, Nagpur, Nashik, Pune, Surat, Thane, Vadodara and Vasai and are divided into different zones. All efforts will be made to allot the candidates who opted for a specific zone to an exam centre in that zone itself. However, in case of shortage of accommodation, in a specific zone, candidates would be allotted to some other zone, where accommodation is available. In such cases, request for change of center will not be entertained under any circumstances. 1 Accounting 03.05.2018 Thursday 2.00 P.M. to 5.00 P.M.
2 Corporate and Other Laws Part I: Company Law 05.05.2018 Saturday 2.00 P.M. to 5.00 P.M.
3 Cost and Management Accounting 07.05.2018 Monday 2.00 P.M. to 5.00 P.M.
4 Taxation 09.05.2018 Wednesday 2.00 P.M. to 5.00 P.M.
5 Advanced Accounting 11.05.2018 Friday 2.00 P.M. to 5.00 P.M.
6 Auditing and Assurance 13.05.2018 Sunday 2.00 P.M. to 5.00 P.M.
7 Enterprise Information Systems & Strategic Management 15.05.2018 Tuesday 2.00 P.M. to 5.00 P.M.
8 Financial Management & Economics for Finance 17.05.2018 Thursday 2.00 P.M. to 5.00 P.M.